It is official: Guinness World Record! 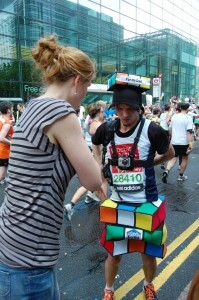 100 cubes in the London Marathon. Unbelievable. Everything worked brilliantly. Except poor Julie had to stop briefly because of a cramp and I had to run on my own. But she made it to the finish line half an hour later. Thank you so much, Julie! I wouldn’t have been able to do it without you!!! I had so much support from so many people and half the office was involved – a big thanks to Random42 Medical Animation! Thank you all so much for the donations! Unbelievable!!! Congratulations!! So excited to hear it went well!